Dear reader we have discussed few posts about contact pressure distribution beneath foundation considering either rigid or flexible foundation supported on cohesive or cohesionless soil. 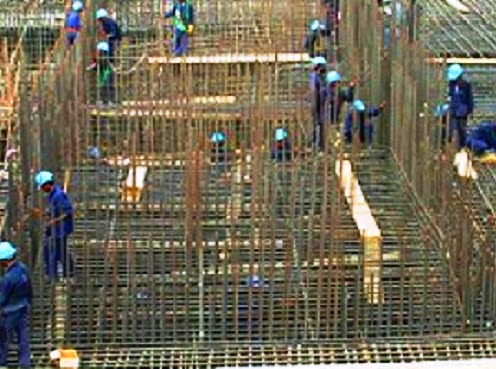 Here we also discuss same thing but we are considering raft foundation. We have already clarified raft foundation and mat foundations are identical foundation system. In discussing combined footing our aim is to coincide center of gravity of foundation with center of resultant load, to have uniform pressure distribution; to achieve these, we have introduced foundation like trapezoidal footing. But we have to know-does actually the distribution is uniform throughout the foundation? Say contact pressure is not uniform, it is maximum at some point exceeding bearing pressures and in some location far below bearing pressure, the foundation is not only inefficient-uneconomical but also it is unsafe considering settlement, shear failure etc. When we consider internal stability that is the foundation itself safe structurally-say thickness, reinforcement and serviceability are not served, the structure will also collapsed.